Yes, current economic growth is good, but not great. Inflation and interest rates currently remain low which creates an environment in which using debt remains opportunistic. But rising debt levels has a negative economic consequence. As shown, prior to the deregulation of the financial industry under Ronald Reagan, which led to an explosion in consumer credit issuance, it required just $1.25 of total system-wide debt to create $1.00 of economic growth. Today, it requires $3.83 to create the same $1 of economic growth. This shouldn’t be surprising, given that “debt” detracts from economic growth as the required “debt service” diverts income from savings and productive investment leading to a “diminishing rate of return” for each new dollar of debt. However, debt levered economic cycles are a function of the ability to draw forward future consumption. But there is a finite limit to the “positive” effect of a debt-driven economic cycle. Eventually, the “bill” must be paid. 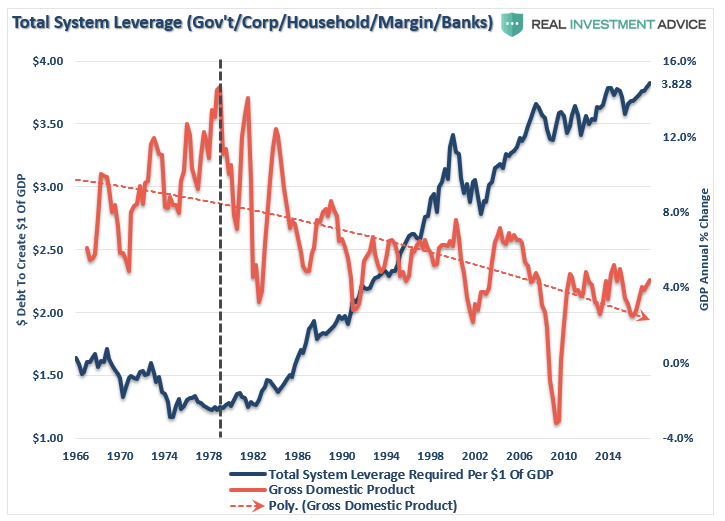 This particular debt-levered economy has been supported by the ongoing, and seemingly never-ending, monetary stimulus being injected by Central Banks. Since, “quantitative easing” programs are the Central Bank’s “emergency measures” for supporting the financial system during crisis events, then why are Central Banks still engaged in these programs nearly a decade later? Yes, indeed. Everything does seem to be firing on all cylinders. “Economically speaking, things have rarely been better. The monthly Citigroup Economic Surprise index is hitting levels not seen 2004 and 2012. 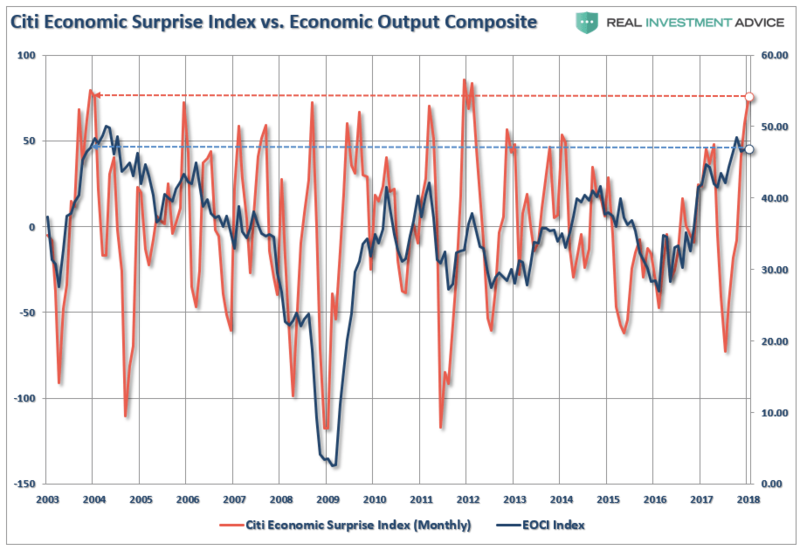 We can also confirm Citigroup’s index by comparing it to the Economic Output Composite Index which is also registering its highest levels since 2004 as well. According to the June 2017 snapshot from the Social Security Administration, nearly 61.5 million people were receiving a monthly benefit check, of which 68.2% were retired workers. Of these 41.9 million retirees, more than 60% count on their Social Security to be a primary source of income. Of course, that dependency ratio is directly tied to financial insolvency of the vast majority of Americans. According to a Legg Mason Investment Survey, US “baby boomers” have on average $263,000 saved in defined contribution plans. But that figure is less than half of the $658,000 they say they will need to retire. 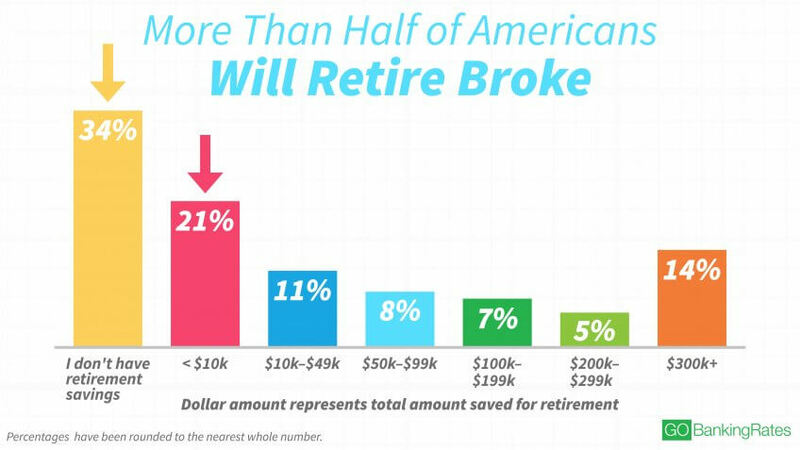 As noted by GoBankingRates, more than half of Americans will retire broke. This is a huge problem that will not only impact boomers in retirement, but also the economy and the financial markets. It also demonstrates just how important Social Security is for current and future generations of seniors. While the financial media incessantly drone on about the rise of the stock market, the problem is that most Americans did not have the financial capacity to participate after two devastating bear markets particularly after following Wall Street advice. As the cost of living is affected by the rising food, energy and healthcare prices without a compensatory increase in incomes – more families are forced to turn to underfunded government assistance in order to survive. Without government largesse, many individuals would literally be living on the street. The chart above shows all the government “welfare” programs and current levels to date. The black line represents the sum of the underlying sub-components. While unemployment insurance has tapered off after its sharp rise post the financial crisis, social security, Medicaid, Veterans’ benefits and other social benefits have continued to rise. Importantly, for the average person, these social benefits are critical to their survival as they make up more than 22% of real disposable personal incomes. With 1/5 of incomes dependent on government transfers, it is not surprising that the economy continues to struggle as recycled tax dollars used for consumption purposes have virtually no impact on the overall economy. Each boomer has not produced enough children to replace themselves which leads to a decline in the number of taxpaying workers. It takes about 25 years to grow a new taxpayer. We can estimate, with surprising accuracy, how many people born in a particular year will live to reach retirement. The retirees of 2070 were all born in 2003, and we can see and count them today. 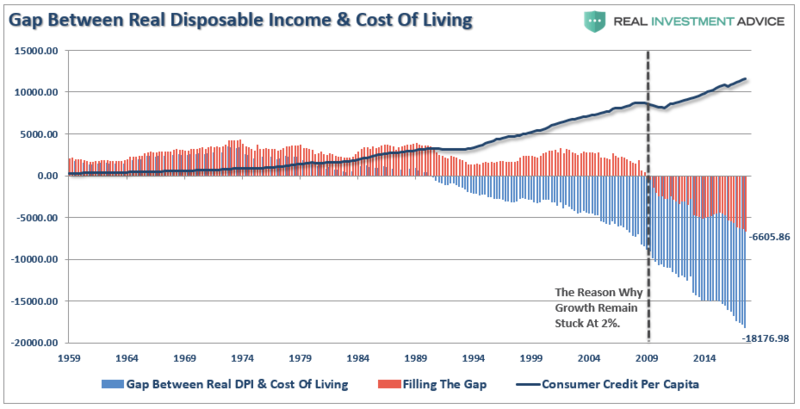 The decline in economic prosperity, that we have discussed extensively, caused by excessive debt, reduction in savings, declining income growth due to productivity increases and the shift from a manufacturing to service-based society will continue to lead to lower levels of taxable incomes in the future. As millions of “baby boomers” approach retirement, more strain is put on the fabric of the welfare system. The exact timing of this crunch is less important than its inevitability. But it is NOT just the “social security” pension system that is at risk, but rather ALL pensions upon which retirees are dependent on. This problem is not something born of the last “financial crisis,” but rather the culmination of 20-plus years of financial mismanagement. With pension funds already wrestling with largely underfunded liabilities, the shifting demographics as noted above are further complicating funding problems. Lastly, and a point clearly missed by Ms. Yellen in her quest to dismiss financial crisis risks, is the $3 Trillion “Pension Crisis” that is just one sharp market downturn away from imploding. The cresting of the “baby boom” generation now puts these massively underfunded pensions at risk of a “run on assets” during the next downturn which could send the entire system into chaos. Of course, this problem can be directly traced to the malfeasance of pension fund managers, and pension boards, which used excessively high return rates to lower costs of contributions. “By over-estimating returns, it has artificially inflated future pension values and reduced the required contribution amounts by individuals and governments paying into the pension system. The unfunded obligations of approximately $4-$5 trillion, depending on the estimates, would have to be set aside today such that the principal and interest would cover the program’s shortfall between tax revenues and payouts over the next 75 years. When the next major bear market comes growling, the “financial crisis” won’t be secluded to just sub-prime auto loans, student loans, and commercial real estate. The real crisis comes when there is a “run on pensions” when the “fear” prevails that benefits will be lost entirely. American corporations are levered to the hilt with total corporate debt surging to $8.7 trillion – its highest level relative to U.S. GDP (45%) since the financial crisis. In just the last two years, corporations have issued another $1 trillion of new debt NOT for expansion but primarily for share buybacks to boost bottom line earnings per share. Note: This is also why “repatriation” won’t lead to massive economic growth, wages or employment. Instead, it will largely go to share buybacks, dividends, and executive compensation, none of which promote innovation, the lifeline for future economic growth. For the last 9-years, the Fed’s “zero interest rate policy” has left investors chasing yield and corporations were glad to oblige. The end result is the risk premium for owning corporate bonds over U.S. Treasuries is at historic lows. I have written for some time that during the next market reversion, the 10-year rate will fall towards “zero” as money seeks the stability and safety of the U.S Treasury bond. However, corporate bonds are an entirely different issue. 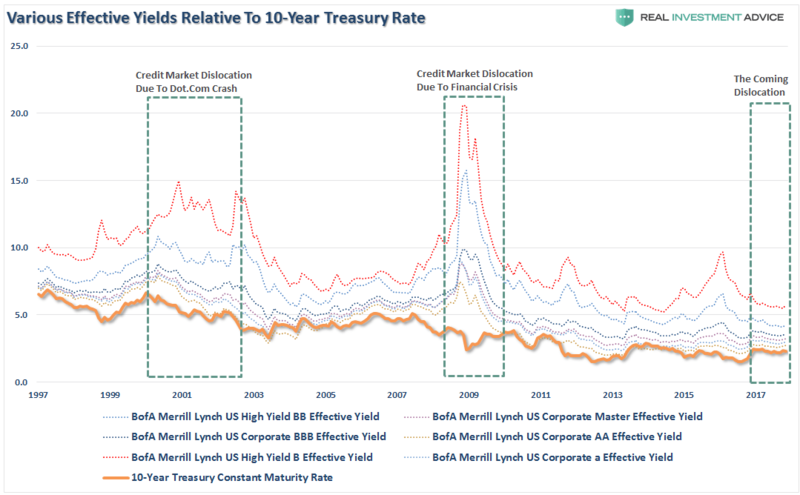 When “high yield,” or “junk bonds,” begin to default in great numbers, as they always do in a recession, which is why they are called “junk bonds” to begin with, investors will face sharp losses on the one side of their portfolio they “thought” was supposed to be safe. Let the panic selling begin. As shown below, when the rout begins, the yields on junk bonds sharply deviate from that of the U.S. Treasury bond. Again, the 10-year Treasury rate is not going higher anytime soon, but everything else likely will. As the markets decline, there will be a slow realization “this decline” is something more than a “buy the dip” opportunity. As losses mount, the anxiety of those “losses” mount until individuals seek to “avert further loss” by selling. 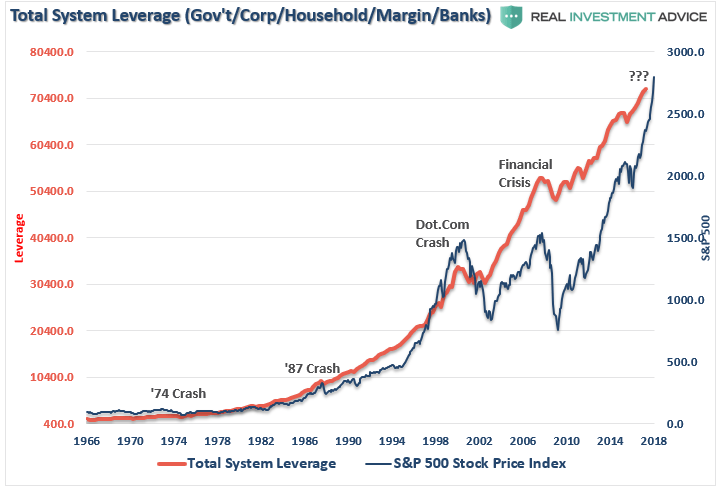 While investors have been chasing returns in the “can’t lose” market, they have also been piling on leverage in order to increase their return. Importantly, don’t mistake record margin debt levels as people borrowing against their portfolio just to make larger investment bets. In reality, they are also using leverage to support their lifestyle as well, after all, as long as stocks keep rising it’s like “free money.” Right? 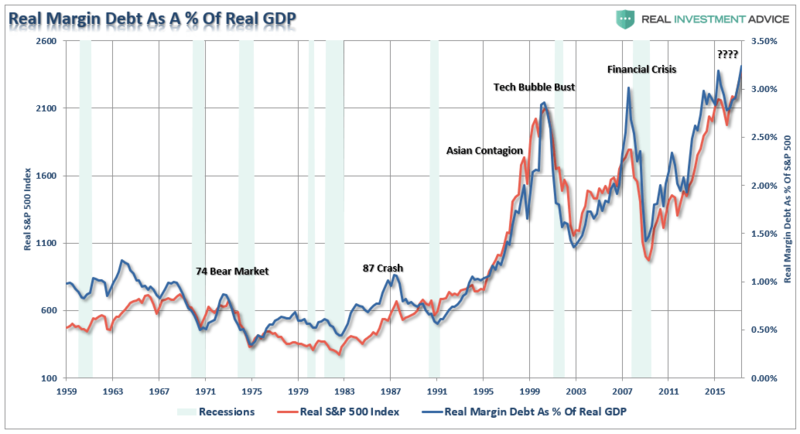 This is shown in both the level of debt used to support the standard of living and the relationship between real, inflation-adjusted, margin debt and economic growth. In the U.S., the Federal Reserve has been the catalyst behind every preceding financial event since they became “active,” monetarily policy-wise, in the late 70’s. 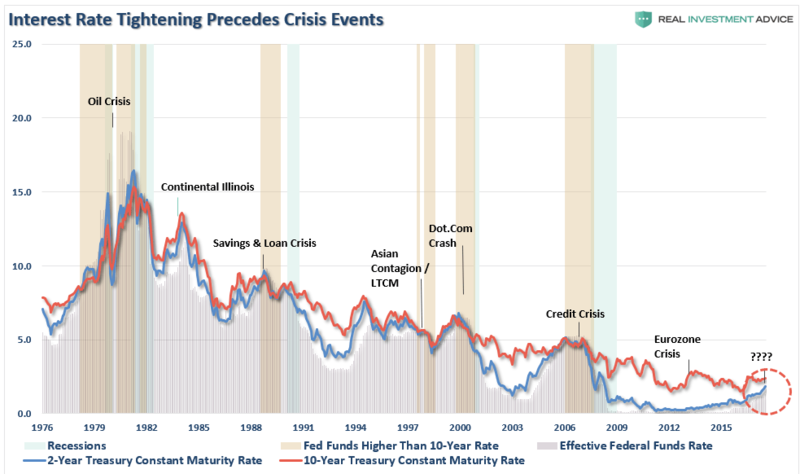 As shown in the chart below, when the Fed has lifted the short-term lending rates to a level higher than the 10-year rate, bad “stuff” has historically followed. With the Fed expected to hike rates 3-more times in 2018, it is likely the Fed has already “lit the fuse” on the next financial crisis-related event. But the risk to investors is NOT just a market decline of 40-50%. While such a decline, in and of itself, would devastate the already underfunded 80% of the population that is currently woefully under-prepared for retirement, it would also unleash a host of related collapses throughout the economy as a rush to liquidate holdings accelerates. The next bear market will not be like the last. It will be worse because it will be spread across the entire financial ecosystem. Pensions, welfare, markets, debt, real estate and savings. But isn’t it worth having a plan in place just in case I’m not? Real Investment Advice: Bringing the complex world of politics, economics, investing and personal financial wealth building to you in simple, easy and informative way. Real Investment Advice is the home of the daily blog and weekly newsletter from Lance Roberts, Chief Portfolio Strategist for Clarity Financial. If you want to understand how money and the economy really work, this is your place to start.